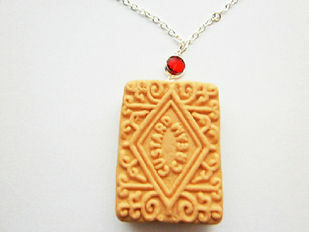 Lovingly created ruby gemstone Custard Cream food pendant from clay. Chain length is around 18in and silver plated. Due to the handmade nature of these products, styles and sizes may vary slightly from picture shown. * This item is not eatable and not suitable for young children.